Motorcycle crashes can be a traumatic event for Tennessee riders. Due to the lack of protection that a motorcycle has, riders can be critically injured in a crash. In 2010, 82,000 riders were injured in motorcycle accidents in the U.S., according to the National Highway Traffic Safety Administration. These crashes can be caused by either the rider or the driver of the passenger vehicle. Exceeding the posted speed limit on roads and highways. Violating the motorcyclists right of way. Making a left turn at an intersection in front of a motorcycle. Changing lanes on the road without signaling your intent. When following a motorcyclist, not leaving enough room between the vehicle and the motorcycle. Failing to see the rider on the road. If your motorcycle accident was caused by a negligent driver, contact Greg Coleman Law today to explore your legal options. For additional information about motorcycle accident lawsuits, complete the Free Case Review form on this page. Also, a motorcycle collision can be caused by a riders lack of experience or defensive driving skills. If you or a family member was injured in a Tennessee motorcycle accident due to the negligence of another, you may be entitled to compensation for medical expenses, lost wages and property damage. Contact Greg Coleman Law to learn more about the legal rights afforded to accident victims. Greg Coleman Law has the knowledge and resources to handle your legal claim. Our personal injury lawyers have successfully litigated numerous cases in Tennessee. The attorneys and staff at Greg Coleman Law will work tirelessly to make sure that you receive the justice that you deserve. 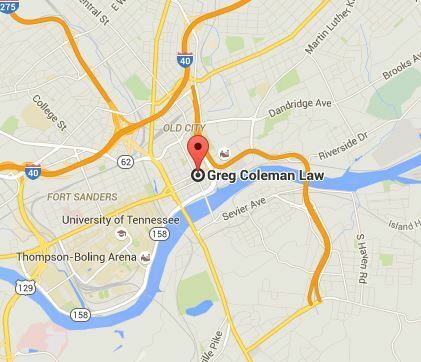 The law firm is available to assist injured individuals in Knoxville and the surrounding areas. To schedule a no obligation consultation, fill out the contact form on this page.